There are so many exciting things happening this time of year, including graduation! 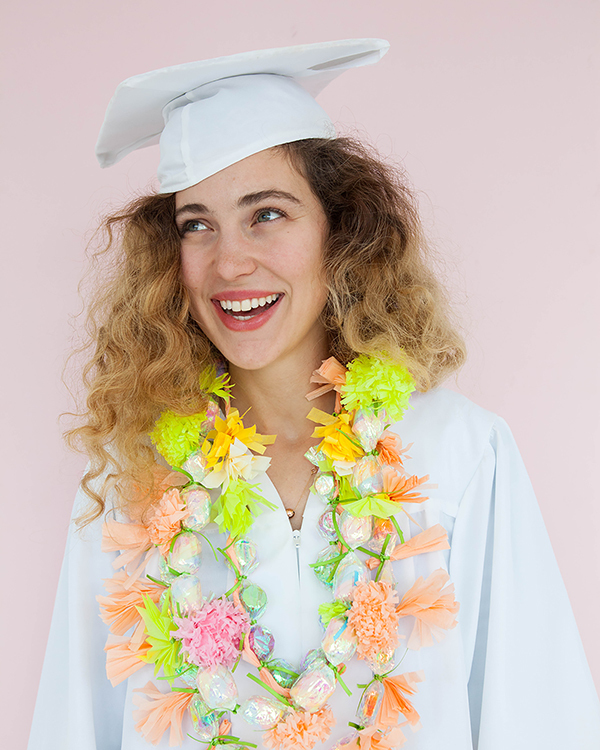 At my high school and college, candy leis were a fun gift that graduates could wear on their special day and enjoy as a treat later. 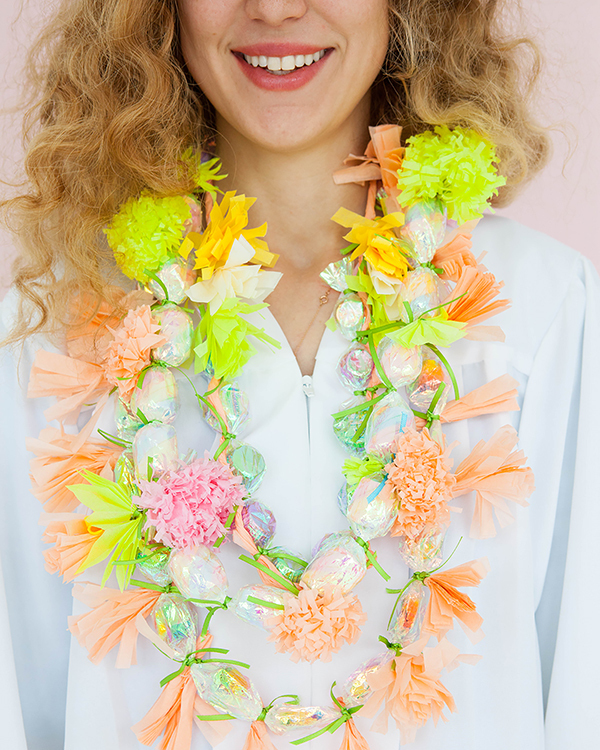 We decided to do our own take on this tradition by adding paper flowers, tassels, iridescent paper, and pops of neon. Hats off to all you graduates! Step 1: Cut a long strip of cellophane 4” tall. Wrap the first piece of candy at the end of the strip, twist, and tie with ribbon. Double knot to secure. Step 2: Add and wrap more candy into the cellophane until the strand is about 35” long. Tie the two ends together to make a basic lei. Cut fringe from a small stack of tissue paper that 4 inches tall 6 inches wide, with each fringe about 1 cm wide. Roll the cut fringe into a paper tassel. Then, twist the top of the tassel and knot a ribbon around it to keep it together. Leave extra ribbon at the ends and trim. Tie a tassel between each piece of candy using the ribbon from the tassel. Cut a small stack of tissue roughly 3” by 9”. Accordion fold the stack of tissue. Tie and knot a piece of ribbon around the middle of the folded paper. Then, cut thin fringe on both ends of the stack. 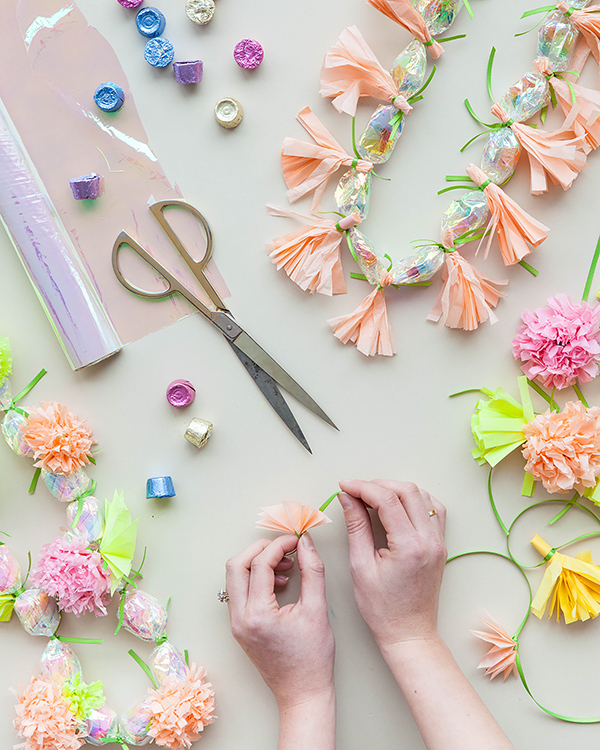 Fan out the individual sheets and separate the fringe until you achieve a fluffy flower. Tie the ribbon from the flower to the candy lei to attach. Wrap candy in cellophane using the same method as the other leis, only keeping it 12” long. Leave extra ribbon when tying off the sections of the lei. Cut a long piece of tissue paper, 4” tall, and twist to form a rope. You can tie two pieces together to achieve a longer strand. Tie the ends together. Use the extra ribbon from the wrapped candy to secure it to the paper necklace. Double knot to secure. 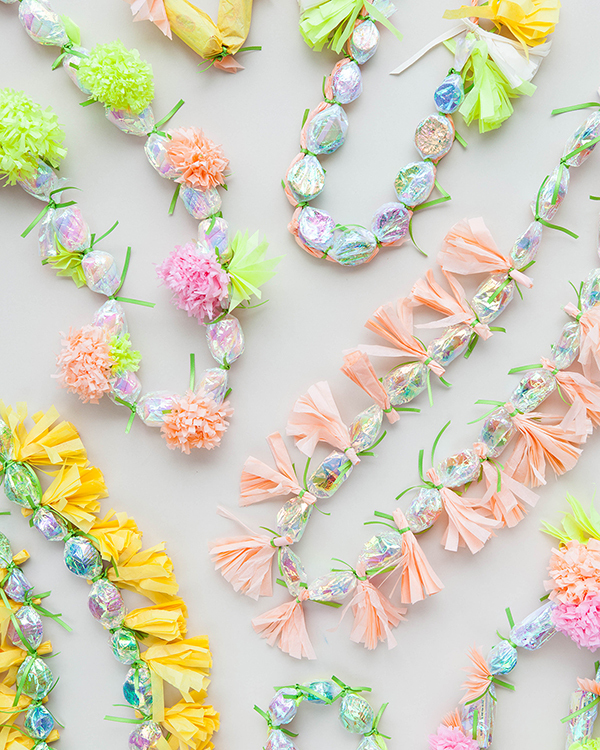 Attach extra flair to the necklace by tying tissue paper tassels at the ends of the wrapped candies. All done! This is such a cool idea, it looks amazing! These are adorable! I need them in my life! I would have loved this when I graduated! I adore this idea too? Could you make them for baby or bridal showers? Fun, colorful and creative. Great job lovely! I see an EPIC Moana inspired birthday with these in brighter colors!!!! These would be adorable for a Hawaiian themed kids party too! !